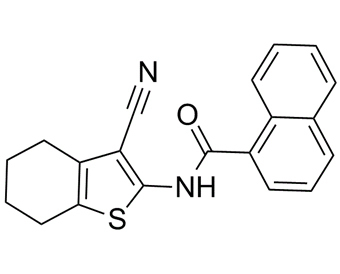 TCS JNK 5a, also called JNK Inhibitor IX , is a selective and potent inhibitor of JNK inhibitor. Exposure of human Jurkat T cells to SC-202671 targeting JNK2 and JNK3, caused apoptotic DNA fragmentation along with G2/M arrest, phosphorylation of Bcl-2, Mcl-1, and Bim, Δψm loss, and activation of Bak and caspase cascade.
. Angell RM, et al. N-(3-Cyano-4,5,6,7-tetrahydro-1-benzothien-2-yl)amides as potent, selective, inhibitors of JNK2 and JNK3. Bioorg Med Chem Lett. 2007 Mar 1;17(5):1296-301.